Just because water and soap are continuously running through your kitchen sink, it doesn’t mean that your kitchen sink is always clean. In fact, it can get rather scummy-looking with debris, grease and other leftovers. Some recommend that you scrub your kitchen sink every night. We know that most people don’t have the time or the wherewithal to do that and that’s okay. In this article we’ll teach you how to clean a kitchen sink on your terms. When you’re ready to clean the sink, remove all dirty dishes and leftover food from your sink. You should have an empty sink as you begin to clean. Wash the entire surface of your sink with a gentle soap, a soft cloth and warm water. A good way to get a clean sink is to use dishwashing liquid in warm water. This can be used to clean faucets, drains and the outer rim. If you can, do this every time you use the sink. If not, thoroughly clean it weekly. Run the hot water into your drain. This step helps eliminate bad odors and can soften any gooey material that’s been left behind in your drain. Wet down the entire sink through this process. If you can, aim to do this several times a week. Pour 1 teaspoon or baking soda and one-quarter cup of lemon juice over the surface of your sink including down the drain. You should let this mixture stand for about ten minutes. Then you use hot water to rinse away the leftover residue. 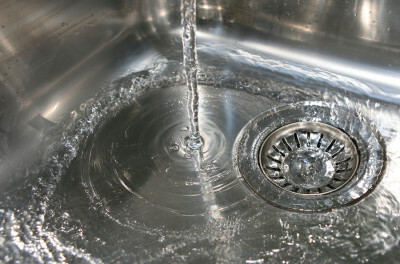 Sanitize the drain with one-half cup of baking soda and one-fourth cup of lemon juice mixed together. Once you put the mixture in the drain, you should pour one-half a cup of white vinegar down that drain. The combination of these ingredients will break up stubborn clogs. Rinse your kitchen sink thoroughly with hot water after you perform any of these cleaning routines. Install a perforated plastic mat in the bottom of your sink. It will protect the sink’s surface from scratches and other imperfections. It will also protect your dishes. Don’t use scouring powders to clean your sink. It’s better to use warm water and a dish detergent formula. Clean your sink gently so that your arms don’t get too tired. If you want to have a sparkling clean kitchen sink, contact us at Maids Around Town. We’re happy to clean your kitchen sink on a regular basis so you don’t have to. We can be reached in Austin at 512-782-4578 or Houston at 832-930-3210.